Unlucky in love Jo is dragged along to see a clairvoyant by her two coupled-up best friends, and is told that there's only one boy for her. The trouble is, the last time she saw him was in a past life, when she worked as a governess to his younger brother. The clairvoyant tells her that as she is back in this life, so is he, and she must find him if she is ever to know true happiness and love. Jo doesn't believe a word of it - but then a series of events begin to change her mind. Could her one true love really be out there? In her quest to find the One, she visits psychics and cemeteries - but will she even be able to recognize her soul-mate when she finds him? Or is she destined to continue looking for love for all of time? I am a Cathy Hopkins fan. I loved the Mates Dates series, so I was looking forward to this one. The thing I like about her books is that she has great female characters. They are not perfect, but on the whole they have good self esteem, good attitudes and good friends. The books are absolutely girly enough to get even the most reluctant teenage girl reading, but they have a bit of substance too. To me this book has a real adult ‘chic lit’ feel about it. Jo has never really had much to do with boys, she has had a few boyfriends but nothing serious. The boy she really likes is notorious bad boy Finn O'Brady, lead singer of a local band, the boy who likes her is her best friends brother, Owen, and just to mix it up a bit more there’s Ben, the moody base player of the band who Jo isn’t too sure about. 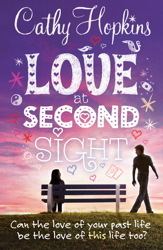 Jo has been told, by a psychic that the reason she has been unlucky in love is that she has had true love once before, when she was a Governess at the end of the nineteenth century. Her destiny is to meet Howard again in this life. This discovery of a possible past life, leads Jo and her friends on a search through time to find out more about Howard and Henrietta and they also find some surprising links to the present day. That’s all good and well, but Howard could be anyone, anywhere, although the psychic did say that soul mates tend to always be drawn together no matter what life they are living. So Jo starts to look for Howard, and wonders (hopes) that he might actually be Finn. The thing I like about this book is that it’s very predictable and clichéd. Why do I like it? Well, because that’s what being a teenage girl is all about. Teenage girls do at some point go for the gorgeous, not-so-nice bad boy, when it’s obvious that it’s not going to work out, and there is a much better choice right there…in front of your eyes. It’s not just teenagers either I might add, there’s been many a romantic comedy and chic lit novel written to the same formula. The thing is, it’s fun and romantic and while the ending is a bit schmaltzy, I think there’s room for a little bit of schmaltz.